Persian cat breed information and advice. Persian cat breed information and advice. The Persian cat is the ultimate glamour puss and one of the most popular pedigree cat breeds in the UK. With their shorter noses and large, striking eyes, Persians are one of those instantly recognisable breeds that command respect. Perhaps their tranquil personalities and slightly aloof expressions lend credence to their reputation as super high-maintenance divas - but it's the perfectly coiffed coat of a Persian champion that seems to sniff: 'We are royalty'! It's impossible to avoid the clear need for regular grooming with the Persian breed, but what most people don't realise, says Isobella Bangs, president of the White Persian Cat Club, is that the strict upkeep regime doesn't necessarily require a lot of time. She admits: "They are high maintenance, definitely. But grooming only takes five minutes each day per cat if you keep on top of it. If you leave it and miss out a day, you'll start to struggle but it's not as time-consuming as some people seem to think." Of course, the coat doesn't make the cat - the Persian personality is another feline facet to admire. Primarily renowned for their serene demeanour and chilled-out attitude, it's not unheard of for these pampered princes and princesses to have the occasional mischievous moment. Isobella laughs: "They can be quite naughty at the midnight hour and run around for a mad five minutes! They're placid cats though. They're very easy to live with. Persians are generally very laid-back and quite domesticated. They like nothing better than lazing around." Don't be fooled by the Persian's docile character though. These preened pussycats are far more intelligent than they're given credit for, and you may find that they soon have you eating out of their paws! Isobella explains: "They're very good at training and will pick new things up very quickly. Mum should hopefully teach them a lot too - I once bred some kittens that were using the litter tray at three weeks old! Persians have a great in-built clock too. They'll know when their dinner is due and will tell you off straight away if it's not on time! "They can get very picky when it comes to food though and will try to get away with not eating it," she smiles. "If they work out that by ignoring their food, you'll come along with something better, you can be sure they'll give it a good go. They train you really!" An Italian nobleman first encountered long-haired cats in Persia in 1621, and he sent four pairs back to Rome. Other imports arrived into Europe from Persia during the 17th century, and as the cat fancy grew, the Persian gained more and more fans. In 1871 Persians were exhibited at the world's first all-breed cat show, and in 1887 official standards for longhaired cats were issued by the National Cat Club. The Persian breed standard has always called for a short face, but early Persians had a much longer face than is seen today. Although the majority of Persians are solid blue, black or white, the breed is now available in a broad spectrum of colours and patterns, including cream, red, blue-cream, chinchilla, smoke, brown, colourpoints, torties and tabbies (although some of these are rare and may require you to find a specialist breeder). The breed's features have changed a lot since it was first shown in the Victorian era. Persians are thick-boned, short and cobby with a short back and legs and short, balanced tails. They have wide-set, small ears and their big, bold eyes are usually orange. However, their peepers are also available in blue, green or bi-colour blue and orange, depending on their coat colour. In the late 1990s, the breed began to suffer from the genetic Polycystic kidney disease (PKD). Isobella Bangs, president of the White Persian Cat Club, assures: "All cats should be DNA-tested and now we're mostly clear of it. The news shook all of us breeders when it came about and we've worked hard to prevent it." Despite this, Persians enjoy very robust health for the most part. Their main welfare concerns come from their grooming needs. As well as the daily, meticulous brush, you'll need to wipe their eyes every day to keep them in tip-top condition. This routine will be even more intense if you choose to show your Persian - a blow-dry on a full coat can take up to three hours! If you're growing your family with a Persian, there are a few things you need to consider. Listen to the breeder's instructions on how to groom them - all good breeders will have ensured that your Persian sees grooming time as a treat to ensure that your task doesn't seem like such a chore! You'll want to check that the kitten's parents have been tested for PKD, and try to see them with the kitten if you can. Look for a healthy, bright-eyed kitten - and check that his upper and lower teeth meet properly, and make sure he's had his vaccinations. The diet sheet is also very important so check with the breeder for your kitten's eating requirements. Is the Persian the cat for you? 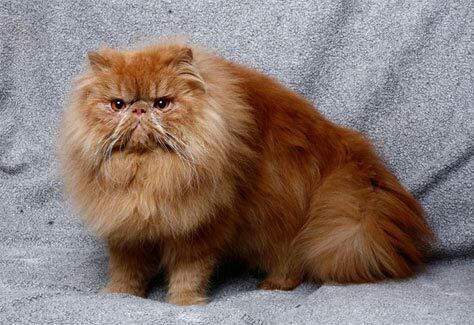 If you're considering getting a Persian, make sure you do your research and talk to breeders so that you fully understand the work involved for their coat maintenance. Your Persian should be fine if you need to go to work, but be aware that it may not be safe for him outside if you live near a busy road. They're very domesticated and are happy to be indoor-only cats. They will cope on their own but ideally they should have company.